A few weeks ago National Post columnist Jonathan Kay wrote a 1661 word polemic extolling the wonderful foods available at McDonald's. Apparently, Kay, inspired by David Freedman's Atlantic piece on how junk food will beat obesity, downloaded an app that provided him with the calorie counts of McDonald's menu items, and armed with the app he headed out to McDonald's and interviewed McDonald's Director of Menu Management - Anne Parks. Besides suggesting that anyone who thinks we eat fast and processed foods too frequently are, "food elitists" and "culinary snobs", Kay's thesis apparently is that with careful tweaking and rejigging of ordered items via the app, something that may lead you to be, according to him, "one of those “When Harry Met Sally" types who hold up the line with instructions and substitutions", you too can shave calories and fat off of your order. Having been at a McDonald's myself 2 weeks ago in New York (they've got that great free wifi, and admittedly, I'm a sucker for their Egg McMuffins), the line at each of the 6 cashes was over 8 people deep. People were in a rush and clearly it's not called fast food for nothing. I'd argue with Mr. Kay that it would only be a "food elitist" who would think that the folks in that line should, could or would use an app to fine tune their orders to non-standard specifications as special orders take much longer to receive. I guess what I'm saying is that just because something is theoretically possible does not necessarily make it theoretically plausible. Moreover, it would appear from the text of Kay's piece that even those in the possession of this wondrous app aren't able to use the information they're being given to evaluate their choices or understand purchasing behaviour. Kay first talks of the existence of salads on McDonald's menu as evidence of how McDonald's "walks the nutritional walk". Of those salads, while some indeed are low in calories and sodium, others, when combined with dressing, have more calories than a Big Mac and nearly a full day's 1,500mg recommendation of sodium. Of course suggesting restaurants are healthy simply consequent to the availability of salads forgets the question of whether or not people actually order them. The answer would be not so much as McDonald's recently reported that salads make up just 2% of sales, and go figure, here again we're talking about a fast food restaurant. I can likely down a Big Mac in under 90 seconds and can do so on the run, but a salad's going to take a great deal longer, and require me to sit down and pull up a chair. "taste remarkably similar to the ones I make at home from scratch." "The McCafé’s Blueberry Pomegranate variety is particularly impressive, because it contains no sweetener beyond fruit juice." Blueberry Pomegranate Smoothie Fruit Base: Blueberry puree, water, clarified demineralized pineapple juice concentrate, raspberry puree, apple juice concentrate, pomegranate juice concentrate, natural (botanical) and artificial flavours, cellulose powder, peach juice concentrate, pear juice concentrate, citric acid, lemon juice concentrate, xanthan gum, pectin, dimethylpolysiloxane, natural colour (fruit and vegetable juice). If Kay were more familiar with nutrition I imagine he would know that when you boil off all the liquid of fruit juice and concentrate it, you're left with plain old sugar. A lot of sugar in fact in the case of these smoothies, with sugar accounting for 88% of their calories. How much sugar? 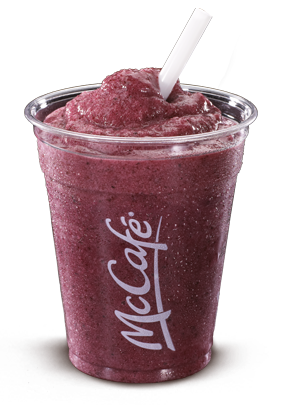 Even if you forgo the yogurt in your smoothie, a so-called "snack" size Blueberry Pomegranate smoothie contains 7.25 teaspoons of sugar, a small - 11.75tsp, a medium - 14.75tsp, and a large - 18.25tsp. For comparison, a Mars bar contains as much sugar as the "snack" sized Blueberry Pomegranate smoothie, while the large has sugar just shy of that which you'd find in 750mL of Coca-Cola (or that of nearly 3 Mars bars). Mr. Kay, while I realize a correction is never going to happen I beg you, before doing another nutrition piece, maybe also run it by someone with a background in nutrition who doesn't in fact have a massive conflict of interest regarding the topic at hand? Ever Struggle To Open Something? Airplane Pretzels - Just Say No! What's Your Most Valuable Relationship?